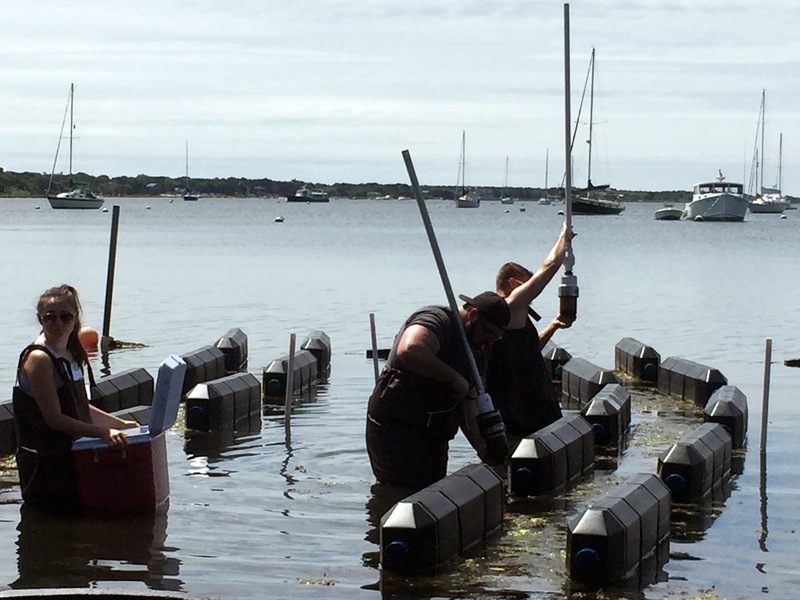 Evaluating effectiveness of different oyster aquaculture strategies for nitrogen loading remediation to inform end user decisions to restore water quality. Increasing population density in coastal areas without adequate infrastructure to manage wastewater needs has led to an increase in the amount of nitrogen(N) delivered to coastal waters. Excess N loading has degraded coastal ecosystem health and caused significant economic impacts. On Cape Cod towns are under regulatory, environmental and legal pressure to implement strategies to restore water quality. 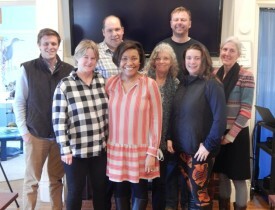 Towns are exploring the use of less costly non-traditional management options such as shellfish aquaculture as part of their water quality management plans. 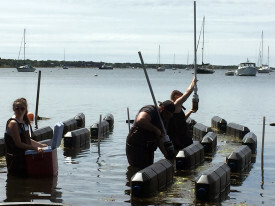 While interest in the approach is strong, managers identify that a consensus does not yet exist on which aquaculture methods provide the most efficient and cost-effective removal of N. Using a strong collaborative approach with potential end users this project will evaluate three of the most popular oyster aquaculture systems – floating bags, rack mount systems and bottom cages – for their efficiency at exporting N to the sediments and stimulating the sediment-hosted biological community to remove N. Results generated and insights gained will be used to inform water quality plans and develop training and a best practices guide for towns, growers, state and regional agencies. Information will also be integrated in education programs for shellfish managers, decision-makers and community members. The research will be conducted in collaboration with the Woods Hole Oceanographic Institution, Stonehill College, Town of Falmouth, Waquoit Bay National Estuarine Research Reserve and Science Wares Inc. We intend to work closely with end users of the science over the course of the project to ensure that the outputs are as useful as possible to managers. Potential end user groups include towns, shellfish officers, water quality managers, MA DEP, DMF, Cape Cod Commission, among others.